Consider: A 16-team football conference with all three service academies in one of its eight-team divisions. Academy rivalries utilized to promote the national identity of a league stretching from Connecticut to California. Academy athletic facilities pumped up by multimillion-dollar television deals. Army Black Knights on blue turf in Boise. Air Force Falcons walking in Memphis. Navy Midshipmen … well, they’re already on board. But you get the idea. ESPN.com’s Brett McMurphy reported earlier this week that the Big East Conference has a three-team expansion wish list — Air Force, BYU and Army. The first two schools would be candidates if the conference stops at 14 football members; it’ll have 13 when Navy joins in three years. Army’s in the mix for what McMurphy called the conference’s “best-case scenario” during an interview with KSL Newsradio — a three-team expansion. The ESPN report also offered potential division alignments for a 14-team Big East, with Navy playing alongside Connecticut, Louisville, Memphis, San Diego State, South Florida and Southern Methodist. 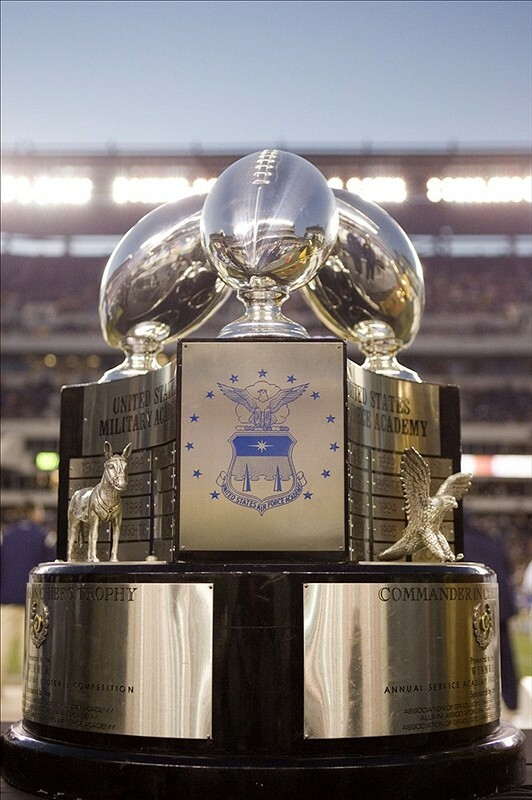 Each team would play all of its division-mates, two random clubs from the other division and a ninth conference game against the same nondivisional opponent each year; Navy would face Temple, for example. That structure falls apart if Air Force joins and disintegrates entirely under a 16-team plan. Army, Air Force and Navy would all need to be in the same division to ensure yearly meetings; a new alignment under those conditions is anybody’s guess. It’s a grand plan that would be made possible by TV money — the Big East is negotiating a new deal with ESPN now and can open up talks with other networks later this year. Even the low end of expectations would offer Army and Air Force millions more per year than their current TV allotments; the pot might need to be sweetened for BYU, which has its own cable network and an existing deal with ESPN. All three expansion targets have been approached unsuccessfully by the Big East before. This time, the TV exposure and a chance for a solid academy league presence — opening up nonleague spots for other teams, instead of using them on rivals — could change some minds. In the radio interview linked above, McMurphy said a deal could come as early as the end of the year, but more likely would come in the summer, depending on when the television deal goes down. Do you want to see the academies in the same division? Why or why not? Comment below, or head here. Yes, the Naval Academy is already in, Notre Dame will eventually be in the ACC full-time, and the Mountain West is now just the WAC on steroids. It will greatly help the USAF Academy, and the US Military Academy to have every game on one of the ESPN networks, and/or NBC/FOX depending on how the tv negotiations work, some logical divisions can be worked out, east/west is best, and the money will be more than any of the great institutions have seen, and can help with all non-revenue sports, not to mention moral of troops around the world. As an Army fan I would love to see the academies in a major conference. I just feel that Army is probably going to wait until they have one or two good seasons back to back, they have shown in the past that they can compete with some of the better teams not ranked in the top 25 so it isn’t crazy to think they can be competitive, but they still need to show some consistency before Army fans will be comfortable seeing their team go into a conference full of teams that are currently better than 75% of their current schedule.